Priscillas: A Baby Bee Blanket.. 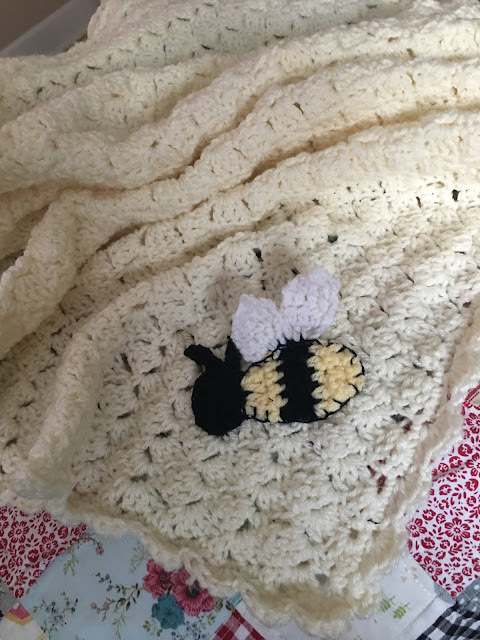 The first crocheted baby blanket for the new grandchild to be is finished! I got this pattern from Pinterest for the blanket .. 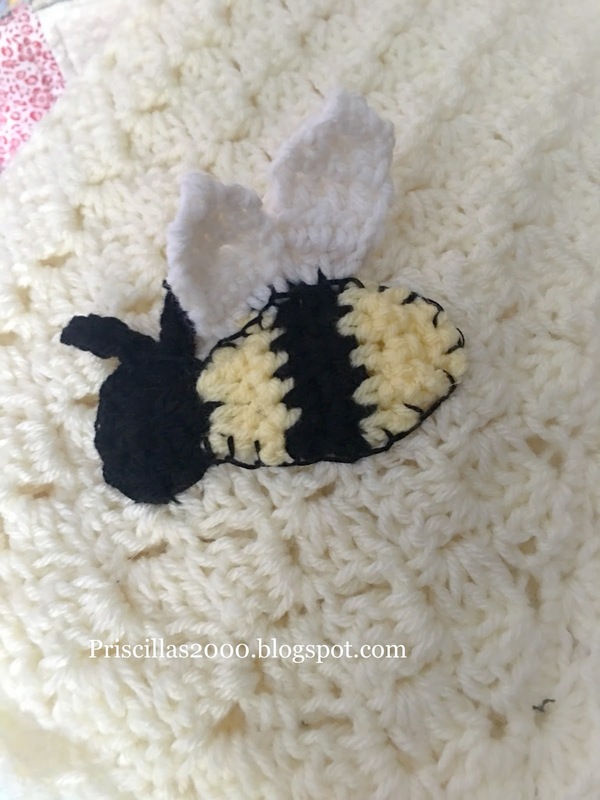 It is done in shell stitch..
and then crocheted the little bee.. 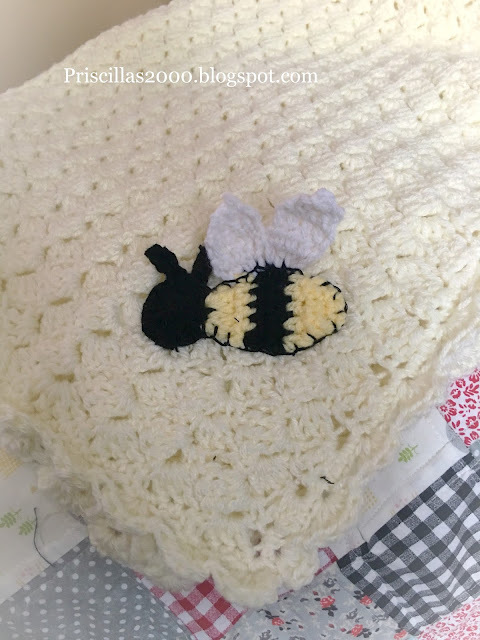 I did not use a pattern for the bee , I just took yarn and a hook and made him ....I think it turned out so cute! I used the I Love This Yarn from Hobby Lobby ..It took 3 skeins of the off white to make the blanket .. I blanket stitched it on the blanket with black . I left the wings and the antennas loose ... for more texture..
Oh my, it is so cute!!! Very cute! Good job designing your own little bee! A bee-u-tiful blanket with your creative touch for your grandchild:). OMGoodness how cute! 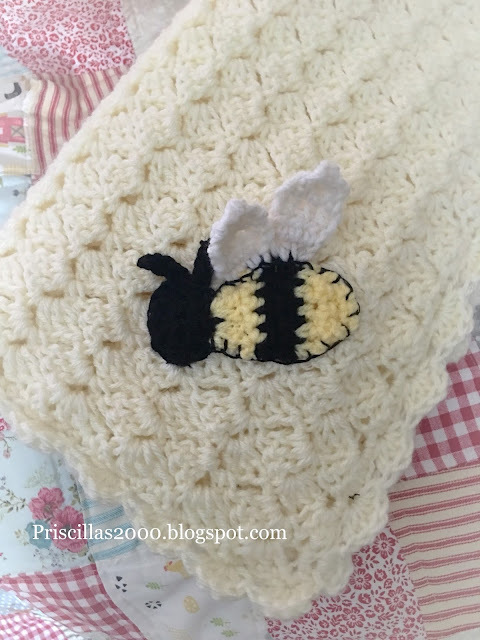 You are a speedy crocheter also! When I made my son an afghan I started it when he was 3...took me 13 years to get that one done! LOL! Nice work i liked it thanks for sharing this kind of simple and good work. Beautiful blanket! Love the little bee. Ah so sweet. The bee finishes it wonderfully. So cute! Hope Chelsea posts pictures of the nursery after you two are done decorating it! Catching up on blogs today! (I follow you on Flosstube, tho it is somewhat difficult to comment from my tv...) Love this little blanket. You did a great job for that future grandbaby!